With two master bedrooms and 3 bathrooms, this magnificent apartment suite, offers a wealth of space. 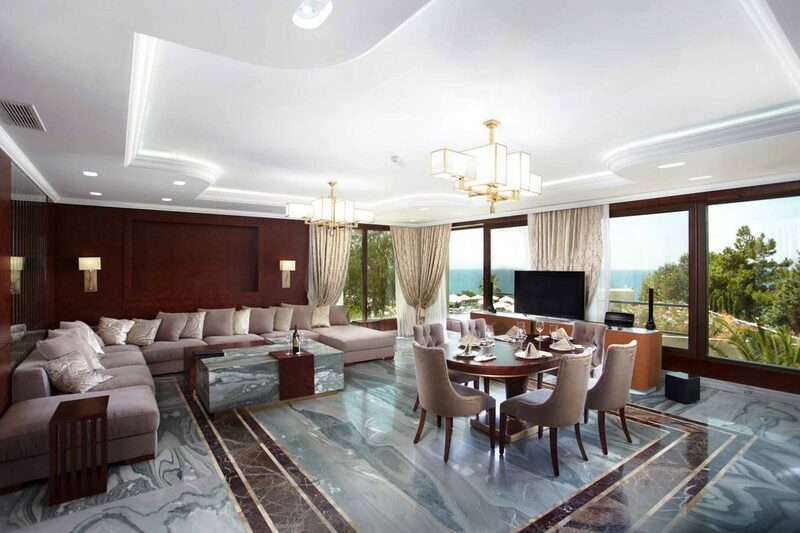 Enjoying a wonderful location, with views stretching out over the Aegean sea and a private balcony overlooking the landscaped gardens, the suite’s deco incorporates exquisite marble decoration and beautiful custom made furnishings. This suite enjoys a private elevator access directly into the suite, two separate bedrooms with super king size beds, two marble bathrooms with hydro-massage bathtubs as well as a third separate guest bathroom and a dedicated private office. The utterly spacious living room comprises of a dining area for up to 6 guests, with upscale audiovisual equipment, a full size refrigerator and a separate wine cooler. This outstanding apartment suite enjoys a space of 160 m2 and sleeps up to 4 adults. Children under the age of 12 years stay free in existing bedding.